So you want to add a new type of document to inFlow On-Premise? Perhaps some documents you use are specific to your particular region or industry, or you just want to streamline your process. Good news: you can create a custom document using Microsoft Word’s Mail Merge feature to let you link that document directly to inFlow! It’s important to keep in mind that this is only for purchase or sales related documents. Note: While we offer the use of custom documents in inFlow, due to their high levels of customization and the limitations of Microsoft Words’s Mail Merge features, in-depth support for custom documents is not available. The custom documents are primarily used for invoices, but you can also create other documents by removing unnecessary columns. For example, as packing slips don’t usually show the prices, you can just remove those columns to get a custom packing slip! Below, we’ll start with the sample document and soon you’ll learn how to show the information listed above! To begin you’ll want to start with one of our sample documents (these are included with your installation). This is the easiest way to start using custom documents and lets you play with an existing template to see how it works. Go to Main Menu > Options > Print Settings. Click the Add New Custom Doc button. Choose one of four types of documents (sales or purchasing documents). Microsoft Word will open up the sample document so that you can make changes to the placement of certain items, or the information that’s included. You’ll notice in the picture above that the sample looks like our default Modern template, but instead of the actual item names and prices, you’ll see things like <<ItemName>>, <<ItemUnitPrice>>, <<ItemQuantity>>, etc. This is referred to as a tag. When imported into inFlow, depending on which order you use the custom document in, it will populate those tags with information in that specific inFlow order. You can move the placement of these tags. For example, if you want the quantity of the item to be placed on the left column, instead of in the middle, or if you want to move the Order Date/ Number to the left instead of right. There is a “rule” in small print just beside the <<ItemSubtotal>> rows, this is a rule that tells Microsoft Word to move on to the next line if the <<ItemName>> tag is not blank. Do not remove this! Otherwise you will see only one item repeating itself. This “rule” is repeated except at the very last row. If you decide you want to remove the subtotal column, copy the rule over to another column you are using. The custom documents don’t pull information from the General/ Print settings screen in inFlow, so you’ll have to re-input your company details (top left, or wherever you want) and logo. Your template should only be one page long. Microsoft Word will repeat the header (customer/vendor info) and totals per page but the items will continue on another page if the order is longer than a page. If you want to add extra tags (for example: tracking number, custom fields, etc) that don’t normally show up in the default document, you must link Microsoft Word to a data source that contains these extra tags first. 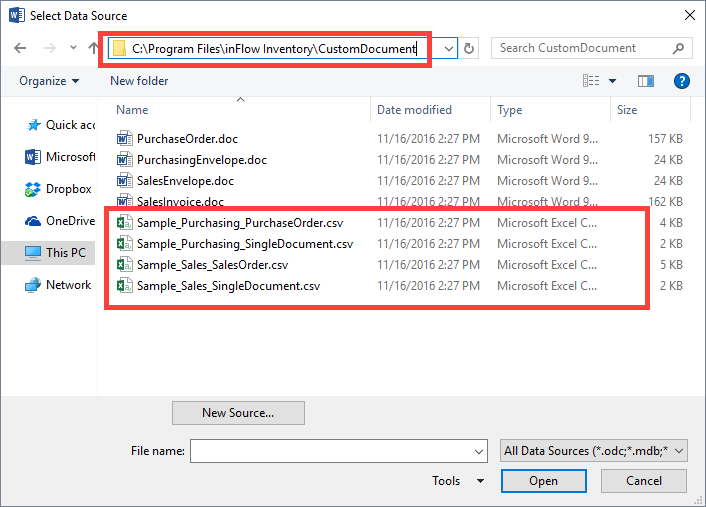 The data source is in the Program Files / inFlow inventory folder, and there are different sources depending on if the custom document is going to have purchasing/vendor information or sales/customer information. This step needs to be followed any time you’re going to ADD tags to a document (whether new or one of our samples). If you’re just removing tags then you can skip this step and just save your document. Open your sample document / template. Click the Mailings Ribbon and choose Start Mail Merge. Choose Directory from the list. This will open a window in where you can browse to the correct data source (CSV file). There are four available which can be found in C:Program FilesinFlow InventoryCustomDocument. Sample_Purchasing_PurchaseOrder.CSV: all the available tags from a purchase order including items, vendor pricing, purchase order info etc. Use this if you are creating your own purchasing invoice. Sample_Purchasing_SingleDocument.CSV: only order level information like your vendor’s address, no items or itemized details. Use this if you want to have inFlow address your envelopes for sending out your purchase orders. Sample_Sales_SalesOrder.CSV: all the available tags from a sales order including items, sales pricing, sales order info etc.Use this if you are creating your own sales invoice. 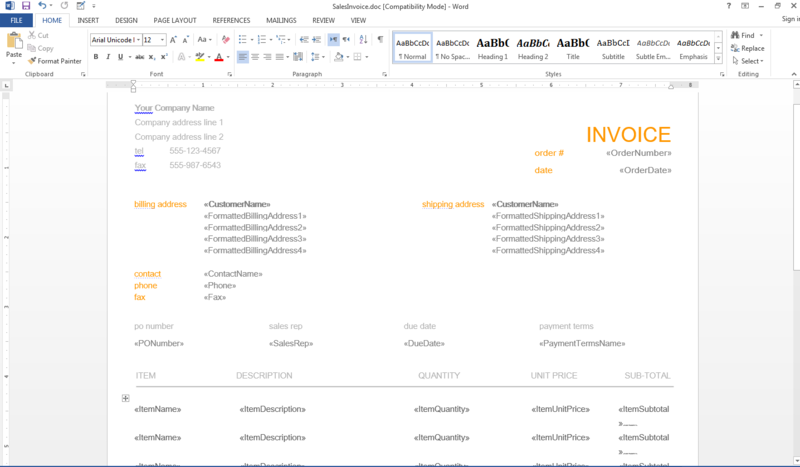 Sample_Sales_SingleDocument.CSV: order level information like your customer’s address, no itemized information. Use this if you want to have inFlow address your envelopes for sending out your invoices. Now that you’ve linked your document to that source file you can insert the available tags via the Insert Merge Field button. There will be a dropdown list of available tags to add. Thank you for purchasing from our company! This lets inFlow know that you want the customer’s name placed directly after the “Dear” within the letter. Put your cursor where you’d like the new tag to appear. In the Mailings tab, click Insert Merge Field. Choose the tag you want from the resulting list. This will place your tag into the document so that inFlow knows where you want that information to be once printed. In the example above, we replaced the “Payment Terms” text field with “Date Paid” and removed the <<PaymentTerms>> tag. From the “Insert Merge Field” we selected the corresponding <<DatePaid>> tag. You must select the field from the “Insert Merge Field” button. Simply typing out the tag will not work! for unit price after discount, use the <<ItemDiscountedUnitPrice>> tag. for item total weight, use the <<ItemTotalWeight>> tag. for total order weight, use the <<TotalOrderWeight>> tag. for item barcode, use the <<ItemBarcode>> tag. for line number, use the <<LineNum>> tag. for tracking number, use the <<TrackingNumber>> tag. When you’re finished adjusting the document, save it to your desktop (or anywhere you can easily locate it). Now that you’ve created your custom document you’re ready to import the custom document to inFlow to use your custom document. You can also check out our sample documents here.